What is the fastest axis of an array? One of the participants in our geocomputing course asked us a tricky question earlier this year. She was a C++ and Java programmer — we often teach experienced programmers who want to learn about Python and/or machine learning — and she worked mostly with seismic data. She had a question related to the performance of n-dimensional arrays: what is the fastest axis of a NumPy array? Rule 1: Don’t do it. Most of the time the computer is much faster than we need it to be, so we don’t spend too much time thinking about making our programs faster. We’re mostly concerned with making them work, then making them correct. But sometimes we have to think about speed. And sometimes that means writing smarter code. (Other times it means buying another GPU.) If your computer spends its days looping over seismic volumes extracting slices for processing, you should probably know whether you want to put time in the first dimension or the last dimension of your array. Let’s think about a two-dimensional case first — imagine a small 2D array, also known as a matrix in some contexts. I’ve coloured in the elements of the matrix to make the next bit easier to understand. So if this was a seismic volume, we might organize inlines in the first dimension, and travel-time in the last dimension. That way, we can access inlines very quickly, but timeslices will take longer. Lots of programming languages and libraries use row-major memory layout, including C, C++, Torch and NumPy. Most others use column-major ordering, including MATLAB, R, Julia, and Fortran. (Some other languages, such as Java and .NET, use a variant of row-major order called Iliffe vectors). NumPy calls row-major order ‘C’ (for C, not for column), and column-major ‘F’ for Fortran (thankfully they didn’t use R, for R not for row). I expect it’s related to their heritage, but the Fortran-style languages also start counting at 1, whereas the C-style languages, including Python, start at 0. The main practical difference is in the time it takes to access elements in different orientations. It’s faster for the computer to take a contiguous chunk of neighbours from the memory ‘boxes’ than it is to have to ‘stride’ across the memory taking elements from here and there. 2D data: 3.6× faster. Axis 0: 24.4 µs, axis 1: 88.1 µs (times relative to first axis: 1, 3.6). 3D data: 43× faster. 229 µs, 714 µs, 9750 µs (relatively 1, 3.1, 43). 4D data: 24× faster. 1.27 ms, 1.36 ms, 4.77 ms, 30 ms (relatively 1, 1.07, 3.75, 23.6). 5D data: 20× faster. 3.02 ms, 3.07 ms, 5.42 ms, 11.1 ms, 61.3 ms (relatively 1, 1.02, 1.79, 3.67, 20.3). 6D data: 5.5× faster. 24.4 ms, 23.9 ms, 24.1 ms, 37.8 ms, 55.3 ms, 136 ms (relatively 1, 0.98, 0.99, 1.55, 2.27, 5.57). These figures are more or less simply reversed for Fortran-ordered arrays (see the notebook for datails). Clearly, the biggest difference is with 3D data, so if you are manipulating seismic data a lot and need to access the data in that last dimension, usually travel-time, you might want to think about ways to reduce this overhead. What difference does it really make? The good news is that, for most of us most of the time, we don’t have to worry about any of this. For one thing, NumPy’s internal workings (in particular, its universal functions, or ufuncs) know which directions are fastest and take advantage of this when possible. For another thing, we generally try to avoid looping over arrays at all, leaving the iterative components of our algorithms to the ufuncs — so the slicing speed isn’t a factor. Even when it is a factor, or if we can’t avoid looping, it’s often not the bottleneck in the code. Usually the guts of our algorithm are what are slowing the computer down, not the access to memory. The net result of all this is that we don’t often have to think about the memory layout of our arrays. When you’re doing a very large number of accesses to memory or disk. Saving a few microseconds might add up to a lot if you’re doing it a billion times. When the objects you’re accessing are very large. Reading and writing elements of a 200GB array in memory brings new challenges compared to handling a few gigabytes. Reading and writing data files — really just another kind of memory — brings all the same issues. Reading a chunk of contiguous data is much faster than reading bytes from here and there. Landmark’s BRI seismic data format, Schlumberger’s ZGY files, and HDF5 files, all implement strategies to help make reading arbitrary data faster. Converting code from other languages, especially MATLAB, although do realize that other languages may have their own indexing rules, as well as differing in how they store n-dimensional arrays. If you determine that you do need to think about this stuff, then you’re going to need to read this essay about NumPy’s internal representations, and I recommend checking out this blog post by Eli Bendersky too. There you have it. Very occasionally we scientists also need to think a bit about how computers work… but most of the time someone has done that thinking for us. Some of the figures and all of the timings for this post came from this notebook — please have a look. If you have anything to add, or (better yet) correct, please get in touch. I’d love to hear from you. It’s almost the end of another trip around the sun. I hope it’s been kind to you. I mean, I know it’s sometimes hard to see the kindness for all the nonsense and nefariousness in <ahem> certain parts of the world, but I hope 2018 at least didn’t poke its finger in your eye, or set fire to any of your belongings. If it did — may 2019 bring you some eye drops and a fire extinguisher. Anyway, at this time of year, I like to take a quick look over my shoulder at the past 12 months. Since I’m the over-sharing type, I like to write down what I see and put it on the Internet. I apologize, and/or you’re welcome. Big open data, or is it? — about the amazing Volve dataset released by Equinor earlier this year. Don’t miss the follow-up post about its licensing: Volve: not open after all, in which I discuss the license that Equinor chose. x lines of Python: contour maps — making nice contour maps in Python (strictly a 2017 post, but almost all of its traffic came in 2018). What is scientific computing? — the emergence of the ‘digital geoscientist’. 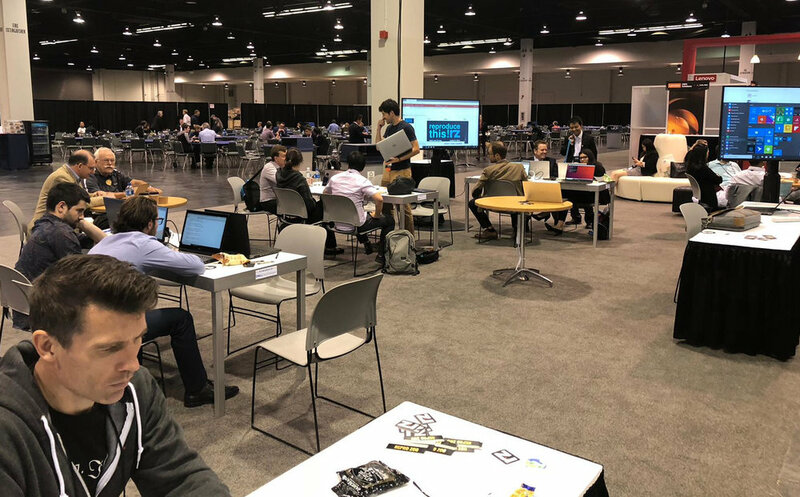 Results from the AAPG machine learning unsession — what happened in Salt Lake City. Jounce, crackle and pop — derivatives of displacement you never knew you cared about. Last December’s post, No more rainbows, got more traffic this year than any of these posts. And, yet again, k is for wavenumber got more than any. What is it with that post?? 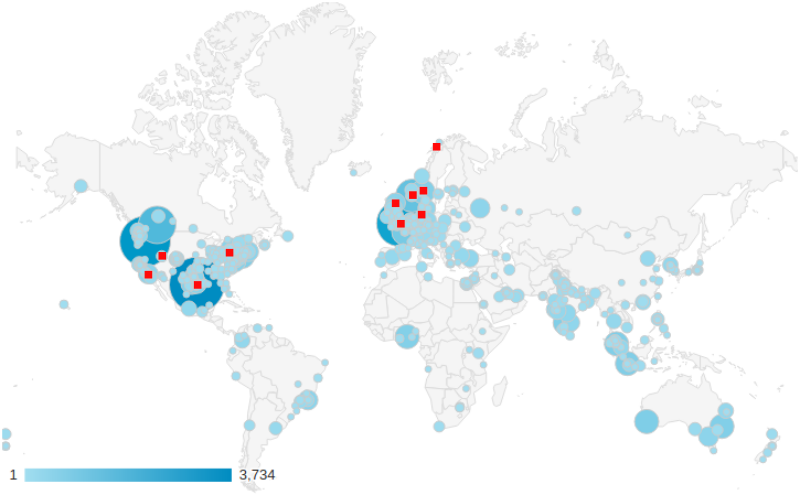 Every year I take a look at where our people are reading the blog from (according to Google). We’ve travelled more than usual this year too, so I’ve added our various destinations to the map… it makes me realize we’re still missing most of you. People often ask us how we earn a living, and sometime I wonder myself. But not this year: there was a clear role for us to play in 2018 — training the next wave of digital scientists and engineers in subsurface. We continued the machine learning project on GPR interpretation that we started last year. We revived Pick This and have it running on a private corporate cloud at a major oil company, as well as on the Internet. We have spent 63 days in the classroom this year, and taught 325 geoscientists the fundamentals of Python and machine learning. Apart from the 6 events of our own that we organized, we were involved in 3 other public hackathons and 2 in-house hackathons. We hired awesome digital geologist Robert Leckenby (right) full time. The large number of people we’re training at the moment is especially exciting, because of what it means for the community. We spent 18 days in the classroom and trained 139 scientists in the previous four years combined — so it’s clear that digital geoscience is important to people today. 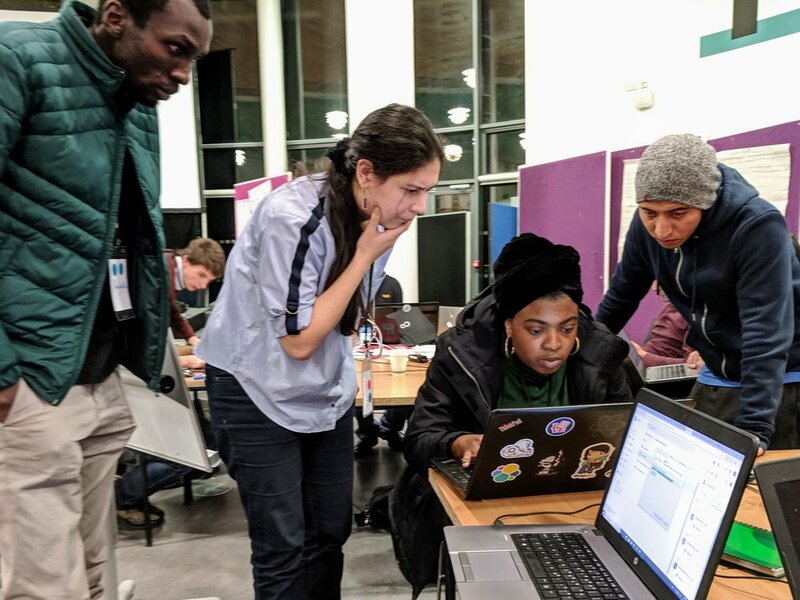 I cannot wait to see what these new coders do in 2019 and beyond! The hackathon trend is similar: we hosted 310 scientists and engineers this year, compared to 183 in the four years from 2013 to 2017. Numbers are only numbers of course, but the reality is that we’re seeing more mature projects, and more capable coders, at every event. I know it’s corny to say so, but I feel so lucky to be a scientist today, there is just so much to do. Agile is, as they say, only wee. And we all live in far-flung places. But the Intertubes are a marvellous thing, and every week we meet new people and have new conversations via this blog, and on Twitter, and the Software Underground. We love our community, and are grateful to be part of it. So thank you for seeking us out, cheering us on, hiring us, and just generally being a good sport about things. From all of us at Agile, have a fantastic festive season — and may the new year bring you peace and happiness. 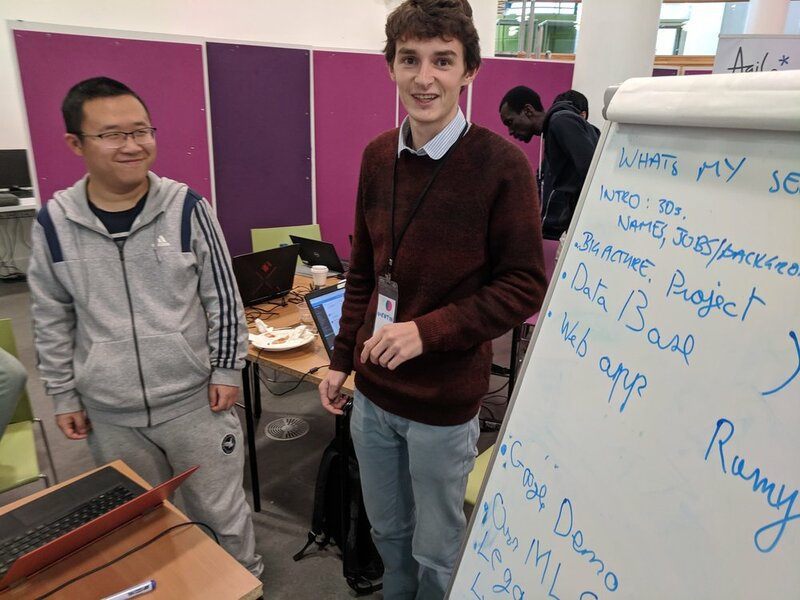 At the end of November I reported on the projects at the Oil & Gas Authority’s machine learning hackathon in Aberdeen. This post is about the follow-up event at London Olympia. 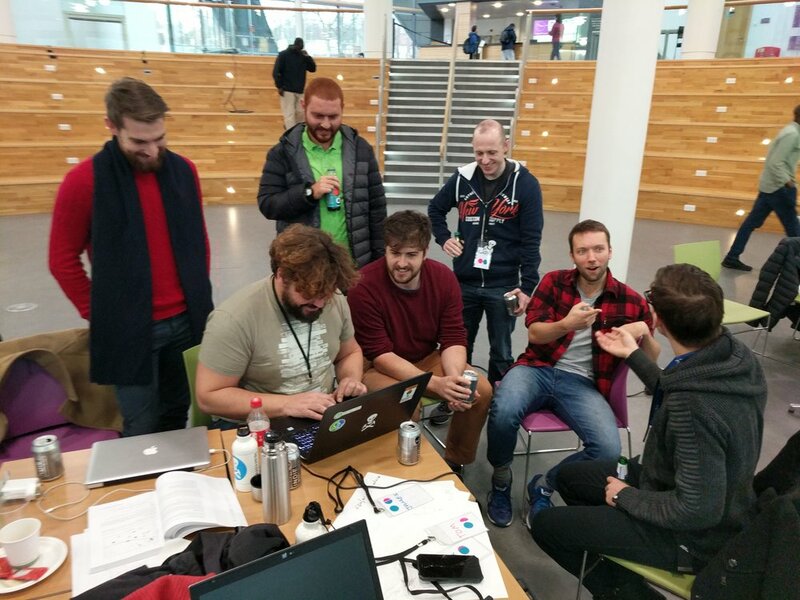 Like the Aberdeen hackathon the previous weekend, the theme was ‘machine learning’. The event unfolded in the Apex Room at Olympia, during the weekend before the PETEX conference. The venue was excellent, with attentive staff and top-notch catering. Thank you to the PESGB for organizing that side of things. 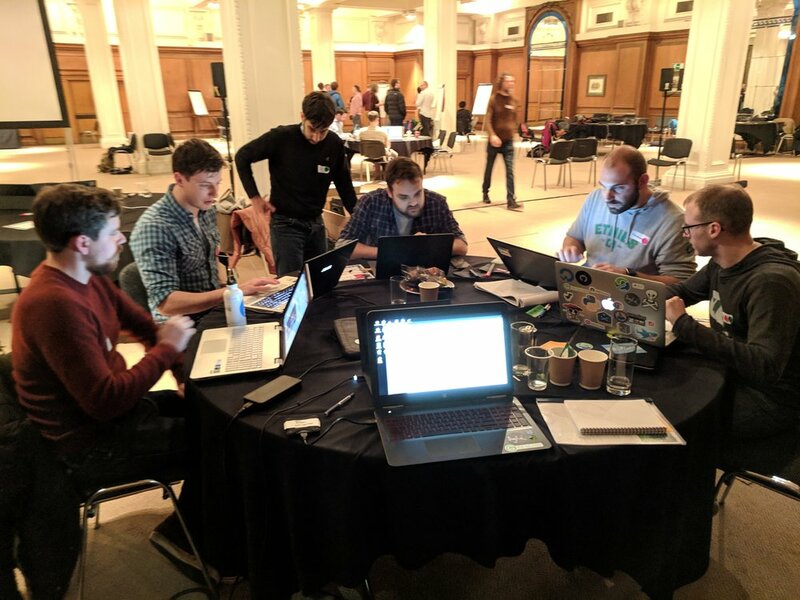 Thirty-eight digital geoscientists spent the weekend with us, and most of them also took advantage of the bootcamp on Friday; at least a dozen of those had not coded at all before the event. 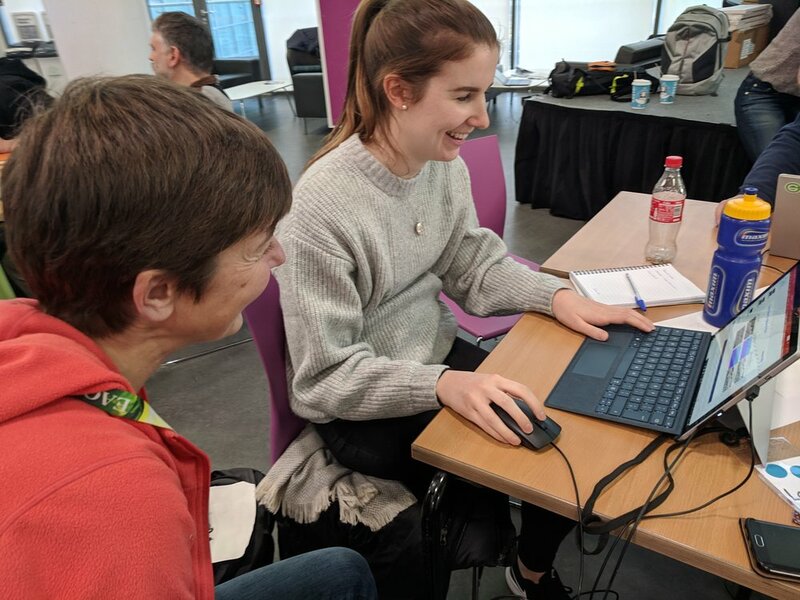 It’s such a privilege to work with people on their skills at these events, and to see them writing their own code over the weekend. Sweet Spot Sweat Shop: Alan Wilson, Geoff Chambers, Marco van der Linden, Maxim Kotenev, Rowan Haddad. Project: We’ve seen a few people tackling the issue of making decisions from large numbers of realizations recently. The approach here was to generate maps of various outputs from dynamic modeling and present these to the user in an interactive way. The team also had maps of sweet spots, as determined by simulation, and they attempted to train models to predict these sweetspots directly from the property maps. The result was a unique and interesting exploration of the potential for machine learning to augment standard workflows in reservoir modeling and simulation. Project page. GitHub repo. Dash AI: Vincent Penasse, Pierre Guilpain. Project: Vincent and Pierre believed so strongly in their project that they ran with it as a pair. They started with labelled production history from 8 wells in a Pandas dataframe. They trained some models, including decision trees and KNN classifiers, to recognizedata issues and recommend required actions. Using skills they gained in the bootcamp, they put a flask web app in front of these to allow some interaction. The result was the start of an intelligent dashboard that not only flagged issues, but also recommended a response. Project page. This project won recognition for impact. Team Mystic Bit: Connor Tann, Lawrie Cowliff, Justin Boylan-Toomey, Patrick Davies, Alessandro Christofori, Dan Austin, Jeremy Fortun. Project: Thinking of this awesome demo, I threw down the gauntlet of real-time look-ahead prediction on the Friday evening, and Connor and the Mystic Bit team picked it up. They did a great job, training a series of models to predict a most likely log (see right) as well as upper and lower bounds. In the figure, the bit is currently at 1770 m. The model is shown the points above this. The orange crosses are the P90, P50 and P10 predictions up to 40 m ahead of the bit. The blue points below 1770 m have not yet been encountered. Project page. GitHub repo. This project won recognition for best execution. Selkie Se7en: Georgina Malas, Matthew Gelsthorpe, Caroline White, Karen Guldbaek Schmidt, Jalil Nasseri, Joshua Fernandes, Max Coussens, Samuel Eckford. 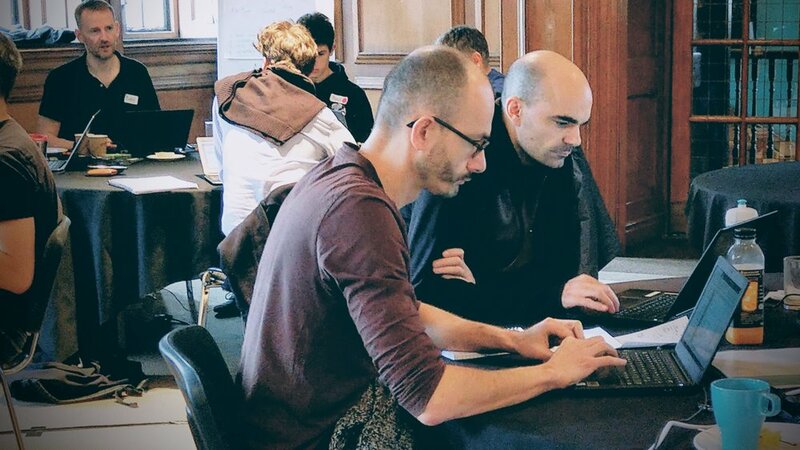 Project: At the Aberdeen hackathon, Julien Moreau brought along a couple of satellite image with the locations of thousands of seals on the images. They succeeded in training a model to correctly identify seal locations 80% of the time. 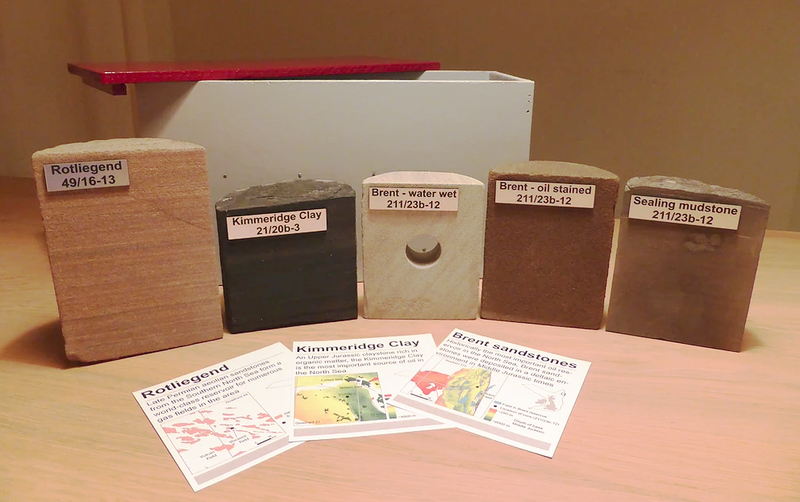 In London, another team of almost all geologists picked up the project. They applied various models to the task, and eventually achieved a binary prediction accuracy of over 97%. In addition, the team trained a multiclass convolutional neural network to distinguish between whitecoats (pups), moulted seals (yearlings and adults), double seals, and dead seals. Impressive stuff; it’s always inspiring to see people operating way outside their comfort zone. Project page. The Lithographers: Gijs Straathof, Michael Steventon, Rodolfo Oliveira, Fabio Contreras, Simon Franchini, Malgorzata Drwila. 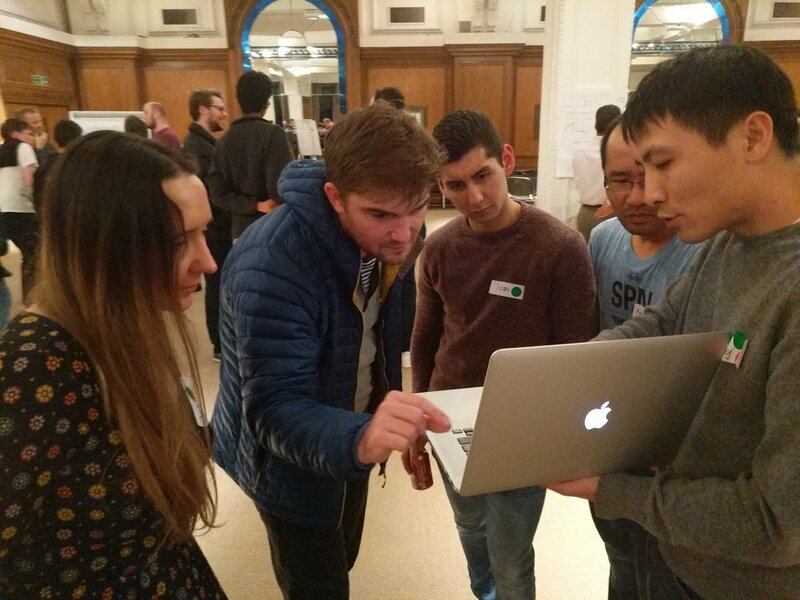 Project: At the project bazaar on Friday (the kick-off event at which we get people into teams), there was some chat about the recent paper on lithology prediction using recurrent neural networks (Jiang & James, 2018). This team picked up the idea and set out to reproduce the results from the paper. In the process, they digitized lithologies from one of the Posiedon wells. Project page. GitHub repo. This project won recognition for teamwork. Team KWYK: Malcolm Gall, Thomas Stell, Sebastian Grebe, Marco Conticini, Daniel Brown. Project: There’s always at least one team willing to take on the billions of pseudodigital documents lying around the industry. The team applied latent semantic analysis (a standard approach in natural language processing) to some of the gnarlier documents in the OGA’s repository. Since the documents don’t have labels, this is essentially an unsupervised task, and therefore difficult to QC, but the method seemed to be returning useful things. They put it all in a nice web app too. Project page. GitHub repo. This project won recognition for Most Value. Cocktail Party Problem: Song Hou, Fai Leung, Matthew Haarhoff, Ivan Antonov, Julia Sysoeva. 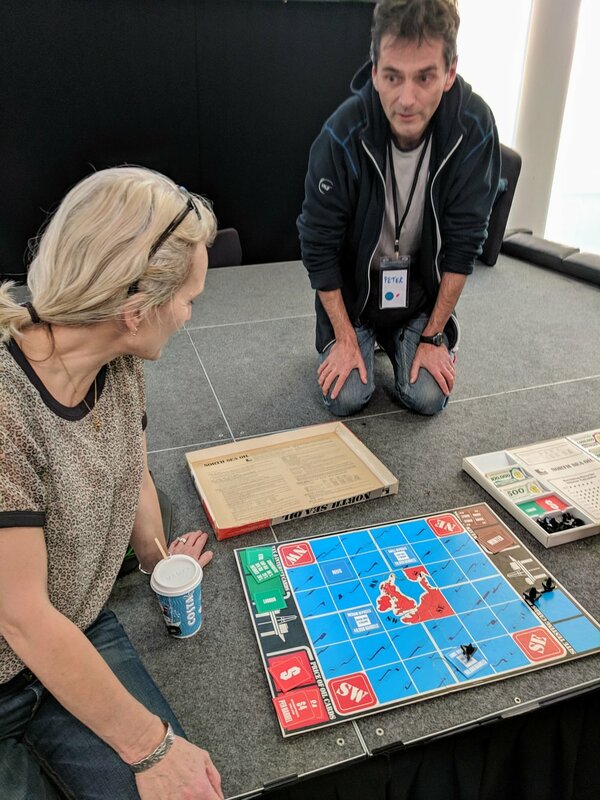 Project: Song, who works at CGG, has a history of showing up to hackathons with very cool projects, and this was no exception. He has been working on solving the seismic source separation problem, more generally known as the cocktail party problem, using deep learning… and seems to have some remarkable results. This is cool because the current deblending methods are expensive. 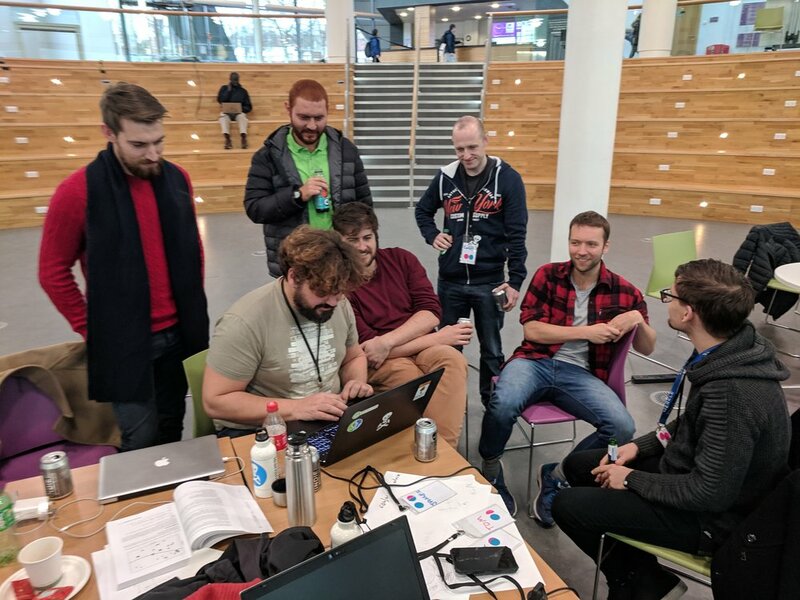 At the hackathon he and his team looked for ways to express the uncertainty in the deblending result, and even to teach a model to predict which parts of the records were not being resolved with acceptable signal:noise. Highly original work and worth keeping an eye on. A big Thank You to the judges: Gillian White of the OGTC joined us a second time, along with the OGA’s own Jo Bagguley and Tom Sandison from Shell Exploration. Jo and Tom both participated in the Subsurface Hackathon in Copenhagen earlier this year, so were able to identify closely with the teams. 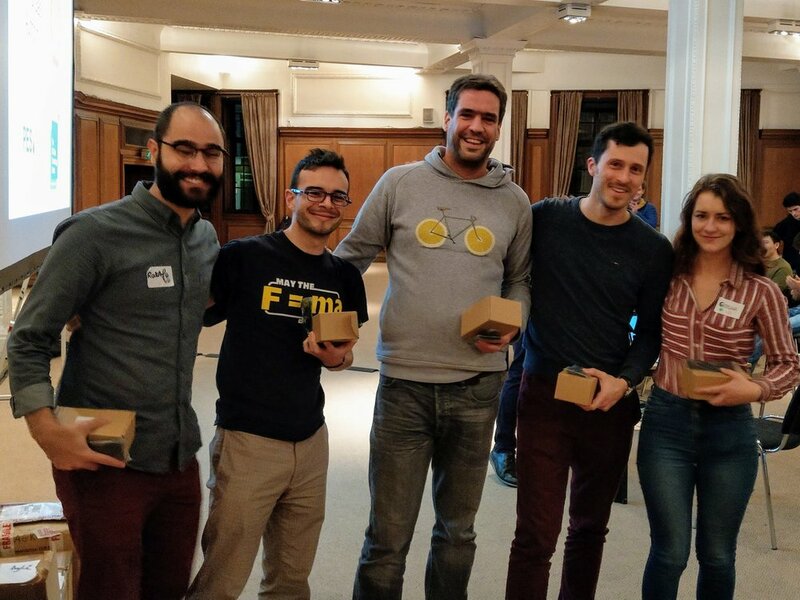 That’s it for hackathons this year! If you feel inspired by all this digital science, do get involved. There are computery geoscience conversations every day over at the Software Underground Slack workspace. We’re hosting a digital subsurface conference in France in May. And there are lots of ways to get started with scientific computing… why not give the tutorials at Learn Python a shot over the holidays? Today is an important day for applied geoscience. For one thing, it’s St Barbara’s Day. For another, 4 December is the anniversary of the first oil discovery drilled on seismic reflection data. During World War 1 — thanks to the likes of Reginald Fessenden, Lawrence Bragg, Andrew McNaughton, William Sansome and Ludger Mintrop — acoustics emerged as a method of remote sensing. After the war, enterprising scientists looked for commercial applications of the technology. The earliest geophysical patent application I can find is Fessenden’s 1917 award for the detection of orebodies in mines, and Mintrop applied for a surface-based method in 1920, but the early patents pertained to refraction and diffraction experiments. The first reflection patent, US Patent no. 1,843,725, was filed on 1 May 1929 by John Clarence Karcher… almost 6 months after the discovery well was completed. Figure 5 from Karcher’s patent, ‘Determination of subsurface formations’. It illustrates the arrivals of different wave modes at the receivers. Karcher was born in Dale, Indiana, but moved to Oklahoma when he was five. He later studied electrical engineering and physics at the University of Oklahoma. Along with William Haseman, David Ohearn, and Irving Perrine, Karcher formed the Geological Engineering Company. Early tests of the technology took place in the summer of 1921 near Oklahoma City, and the men spent the next several years shooting commercial refraction surveys around Texas and Oklahoma — helping discover dozens of saltdome-related fields — and meanwhile trying to perfect the reflection experiment. During this period, they were competing with Mintrop’s company, Seismos. In 1925, Karcher formed a new company — Geophysical Research Corporation, GRC, now part of Sercel — with Everette Lee DeGolyer of Amerada Petroleum Corporation and money from the Viscount Cowdray (owner of Pearson, now a publishing company, but originally a construction firm). Through this venture, Karcher eventually prevailed in the race to prove the seismic reflection method. From what I can tell, HB Peacock and/or JE Duncan successfully mapped the structure of the Ordovician Viola limestone, which overlies the prolific Simpson Group. On 4 December 1928, Amerada completed No. 1 Hallum well near Maud, Oklahoma. The locations (as best I Can tell) of the first test of reflection seismology, the first seismic section, and the first seismic survey that led to a discovery. The map also shows where Karcher grew up; he went to university in Norman, south of Oklahoma City..
Karcher was a geophysical legend. After Geophysical Research Corporation, he co-founded Geophysical Service Incorporated (GSI) which was the origin of Texas Instruments and the integrated circuit. And he founded several explorations companies after that. Today, his name lives on in the J. Clarence Karcher Award that SEG gives each year to one or more stellar young geophysicists. 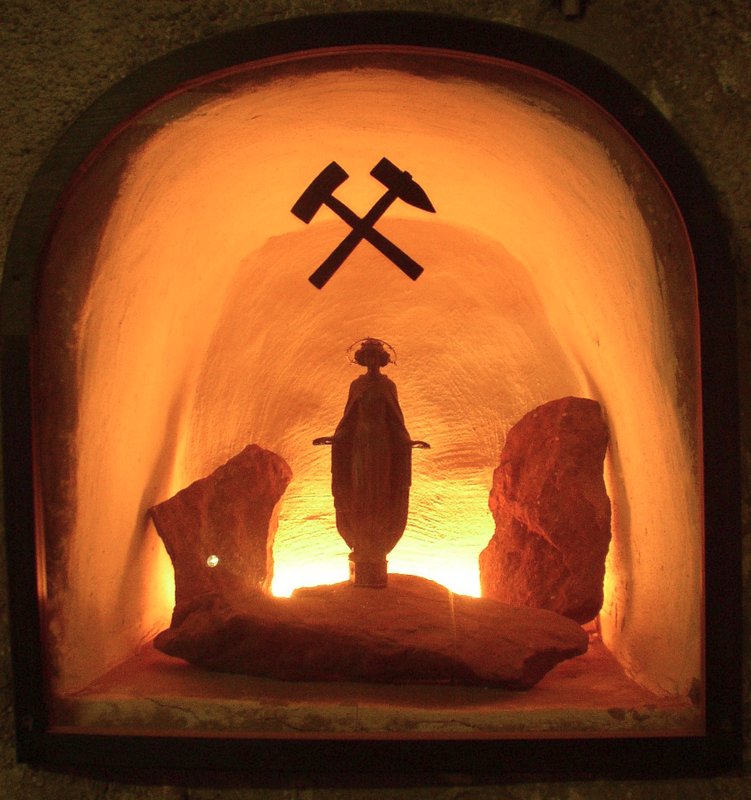 It seems appropriate that the oil discovery fell on the feast of St Barbara, the patron saint of miners and armorers and all who deal in explosives, but also of mathematicians and geologists. If you have a bottle near you this evening, raise a glass to St Barbara and the legion of geophysicists that have made seismic reflection such a powerful tool today. Brown, Raymon. Birth of the seismic-reflection method. In: Special Publication 99, Oklahoma Geological Survey, 6–9. Everett, Diana. Seismograph. Oklahoma Historical Society article. Fessenden, Reginald. US Patent no. 1,240,328. Karcher, John Clarence. Determination of subsurface formations. US Patent no. 1,843,725. Keating, Brendan. How geophysics improved success rates in the oil and gas industry. OPC, UK. Mintrop, Ludger. US Patent no. 1,599,538. Sweet, George (1987). Comment on JC Karcher’s The Reflection Seismograph. The Leading Edge 6 (11). Wells, Bruce. Exploring seismic waves. American Oil & Gas Historial Society article. Wikipedia entry on John Clarence Karcher, and SEG Wiki article on John Karcher. The festive season is speeding towards us at the terrifying rate of 3600 seconds per hour. Have you thought about what kind of geoscientific wonders to make or buy for the most awesome kids and/or grownups in your life yet? I hope not, because otherwise this post is pretty redundant… If you have, I’m sure you can think of <AHEM> at least one more earth scientist in your life you’d like to bring a smile to this winter. I mean, here’s a bargain to start you off: a hammer and chisel for under USD 15 — an amazing deal. The fact that they are, unbelievably, made of chocolate only adds to the uses you could put them to. If your geoscientist is on a diet or does their fieldwork in a warm country, then obviously these chocolate tools won’t work. You could always get some metal ones instead (UK supplier, US supplier). Before you start smashing things to bits with a hammer, especially one that melts at 34°C, it’s sometimes nice to know how hard they are. Tapping them with a chocolate bar or scratching them with your fingernail are time-tested methods, but the true geologist whips out a hardness pick. I have never actually seen one of these (I’m not a true geologist) so the chances of your geoscientist having one, especially one as nice as this, are minuscule. USD 90 at geology.com. Hammers can be used around the house too, of course, for knocking in nails or sampling interesting countertops. If your geoscientist is houseproud, how about some of Jane Hunter’s beautiful textile artworks, many of which explore geological and geomorphological themes, especially Scottish ones. The excerpt shown here is from Faults and Folds (ca. USD 1000); there are lots of others. If textiles aren’t your thing, these hydrology maps from Muir Way are pretty cool too. From USD 80 each. Topographic maps are somehow more satisfying when they are three-dimensional. So these beautiful little wooden maps from ElevatedWoodworking on Etsy, which seem too cheap to be true, look perfect. There’s plenty more for geoscientists on Etsy, if you can look past the crass puns slapped clumsily onto mugs and T-shirts. For example, if geostatistics get you going, start at NausicaaDistribution and keep clicking. My favourites: the Chisquareatops shirt and the MCMC Hammer cross-stitch pattern. I like statistics. Sometimes, not very often, people ask my where my online handle kwinkunks comes from. It’s a phonetic spelling of one of my favourite words, quincunx, which has a couple of meanings, but the most interesting one is a synonym for a Galton board or bean machine. Galton boards are awesome! Demonstrate the central limit theorem right on your desktop! From USD 10: a cheap one, and an expensive one. Oh, and there’s a really lovely/expensive one from Lightning Calculator if your geoscientist is the sort of person who likes to have the best of everything. It costs USD 1190 and it looks fantastic. Let’s get back to rocks. You can actually just give a rock to a geologist, and they’ll be happy. You just might not see much of them over the holiday, as they disappear off to look at it. If your geologist has worked in the North Sea in their career, they will definitely, 100% enjoy these amazing things. Henk Kombrink and Kirstie Wright are distributing chunks of actual North Sea core. The best part is that you can choose the well and formation the rock comes from! 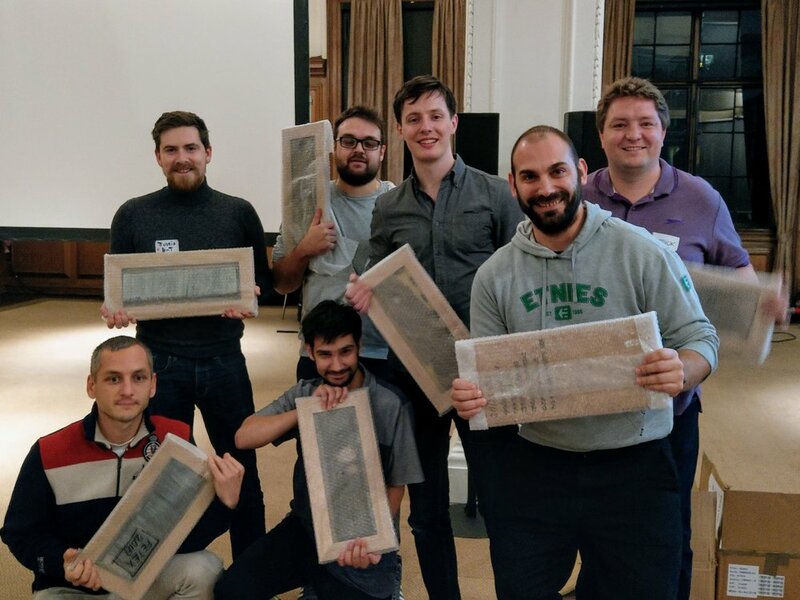 We gave some resinated core slabs away as prizes at the hackathons this month, and the winners loved them. That’s it for this year! I hope there’s something here to brighten your geoscientist’s day. Have fun shopping! Unlike most images on agilescientific.com, the ones in this post are not my property and are not open access. They are the copyright of their respective owners, and I’m using them here in accordance with typical Fair Use terms. If owners object, please let me know. 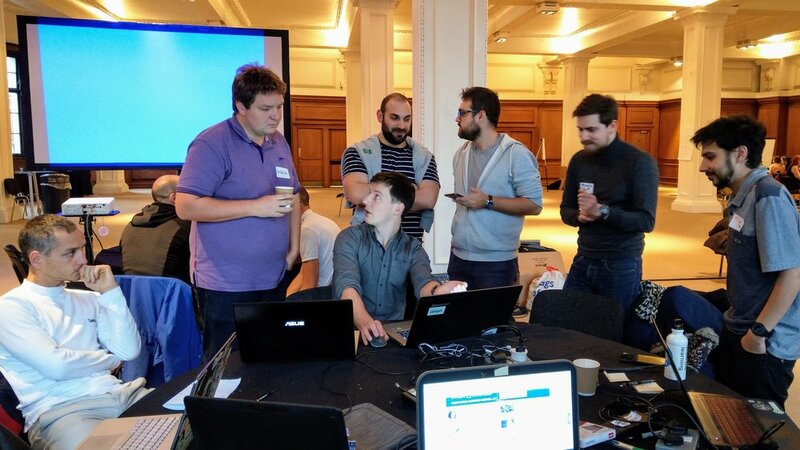 On 16−18 November the UK Oil & Gas Authority (OGA) hosted its first hackathon, with Agile providing the format and technical support. 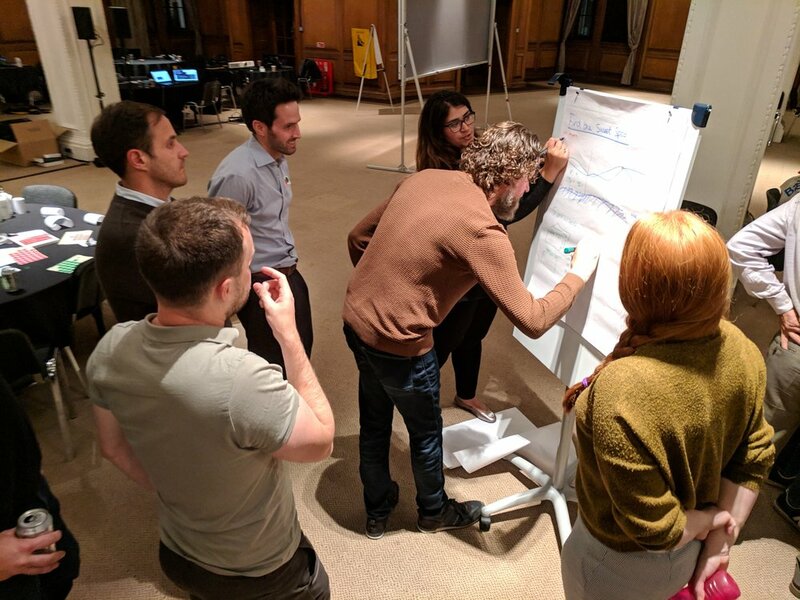 This followed a week of training the OGA provided — again, through Agile — back in September. 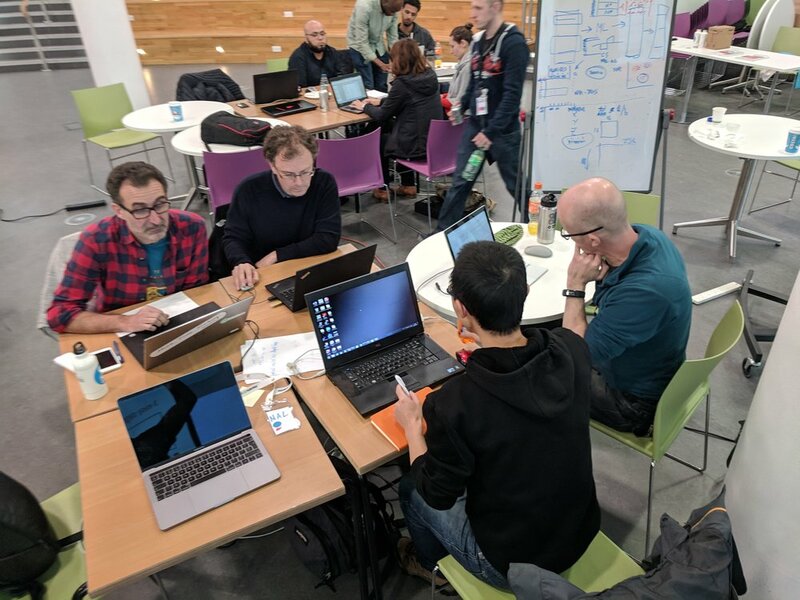 The theme for the hackathon was ‘machine learning’, and I’m pretty sure it was the first ever geoscience hackathon in the UK. Thirty-seven digital geoscientists participated in the event at Robert Gordon University; most of them appear below. 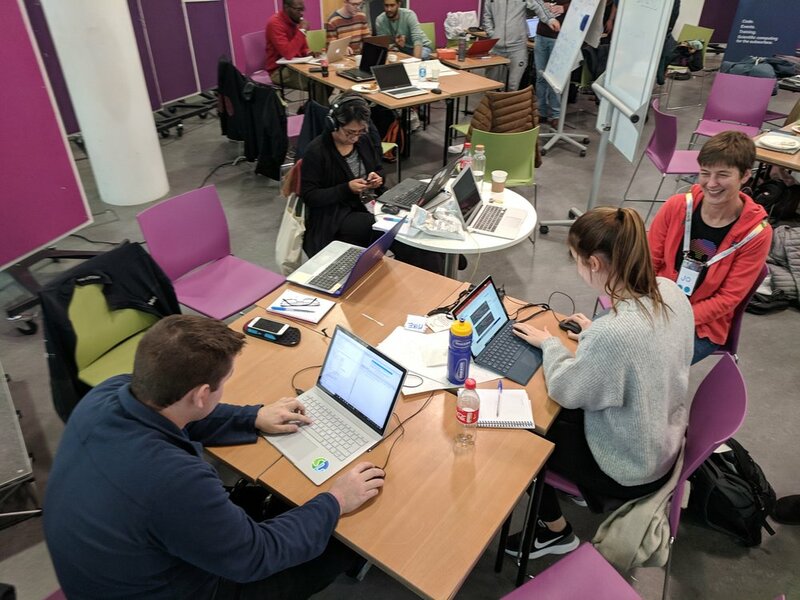 Many of them had not coded at all before the bootcamp on Friday, so a lot of people were well outside their comfort zones when we sat down on Saturday. Kudos to everyone! Seal Team 6: Julien Moreau, James Mullins, Alex Schaaf, Balazs Kertesz, Hassan Tolba, Tom Buckley. 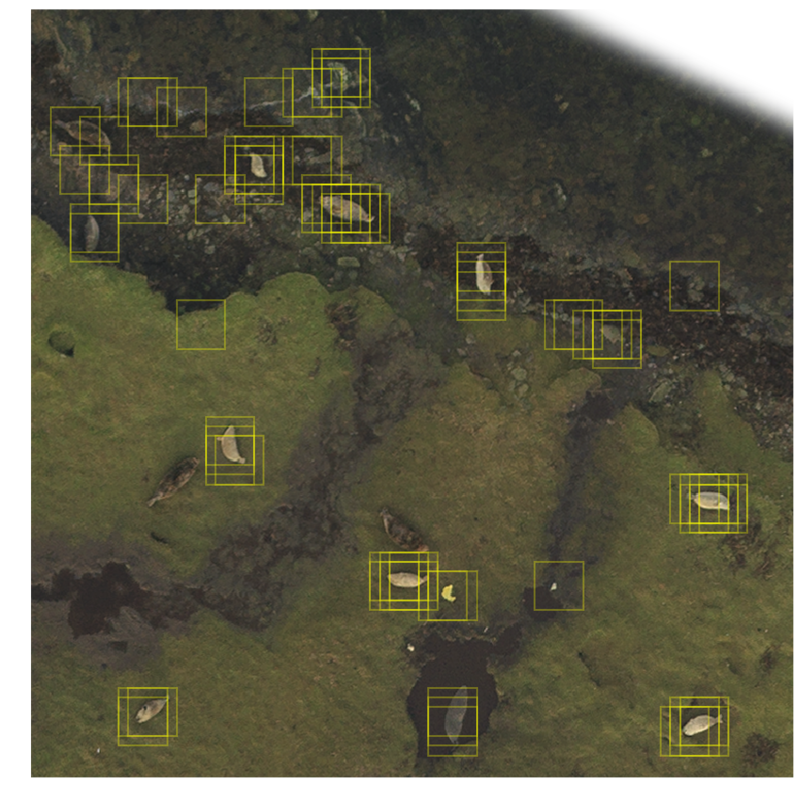 Project: Julien arrived with a cool dataset: over 6000 seals located on two large TIFFs images of Linga Holm, an island off Stronsay in the Orkneys. The challenge: locate the seals automatically. The team came up with a pipeline to generate HOG descriptors, train a support vector machine on about 20,000 labelled image tiles, then scan the large TIFFs to try to identify seals. Shown here is the output of one such scan, with a few false positive and false negatives. GitHub repo. This project won the Most Impact award. Team Seis Class: Jo Bagguley, Laura Bardsley, Chio Martinez, Peter Rowbotham, Mike Atkins, Niall Rowantree, James Beckwith. Project: Can you tell if a section has been spectrally whitened? Or AGC’d? 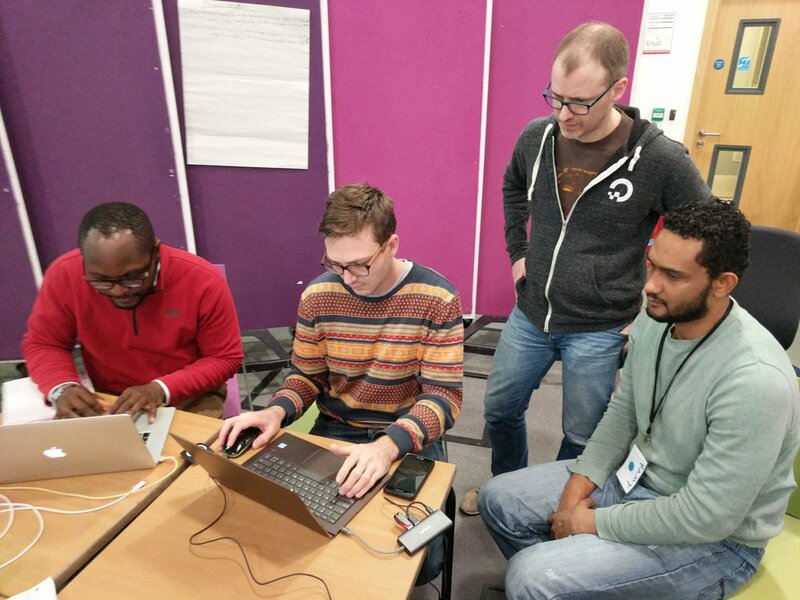 This team set out to attempt to teach a neural network the difference. As a first step, they reduced it to a binary classification problem, and showed 110 ‘final’ and 110 ‘raw’ lines from the OGA ESP 2D 2016 dataset to a convolutional neural net. The AI achieved an accuracy of 98% on this task. GitHub repro. This project won recognition for a Job Well Done. Why do get blocks relinquished? Team Relinquishment Surprise: Tanya Knowles, Obiamaka Agbaneje, Kachalla Aliyuda, Daniel Camacho, David Wilkinson (not pictured). Project: Recognizing the vast trove of latent information locked up in the several thousand reports submitted to the OGA. Despite focusing on relinquishment, they quickly discovered that most of the task is to cope with the heterogeneity of the dataset, but they did manage to extract term frequencies from the various Conclusions sections, and made an ArcGIS web app to map them. Team What’s My Seismic? Quentin Corlay, Tony Hallam, Ramy Abdallah, Zhihua Cui, Elia Gubbala, Amechi Halim. Project: The team wanted to detect the presence of various seismic facies in a small segment of seismic data (with a view to later interpreting entire datasets). They quickly generated a training dataset, then explored three classifiers: XGBoost, Google’s AutoML, and a CNN. All of the methods gave reasonable results and were promising enough that the team vowed to continue investigating the problem. Project website. GitHub repo. This project won the Best Execution award. Team Dynamic Depth Warping: Jacqueline Booth, Sarah Weihmann, Khaled Muhammad, Sadiq Sani, Rahman Mukras, Trent Piaralall, Julio Rodriguez. Project: Making picks and correlations in wireline data is hard, partly because the stratigraphic signal changes spatially — thinning and thickening, and with missing or extra sections. 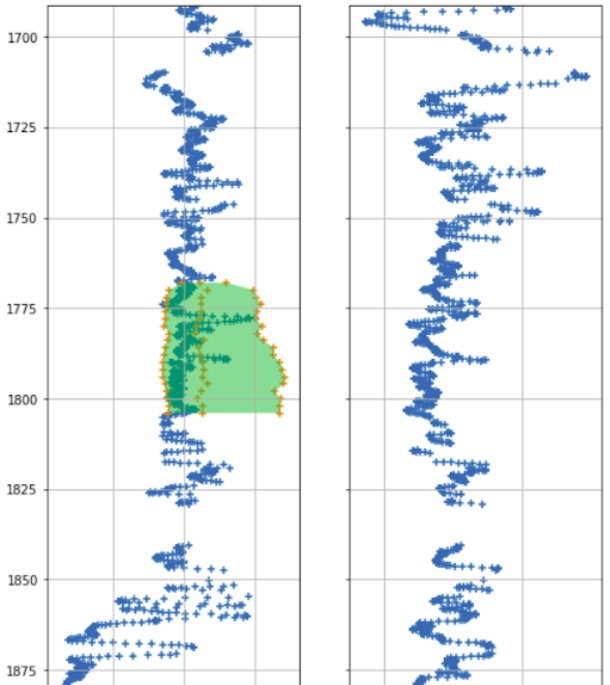 To try to cope with this, the team applied a dynamic time (well, depth) warping algorithm to the logs, then looking for similar sections in adjacent wells. The image shows a target GR log (left) with the 5 most similar sections. Two, maybe four, of them seem reasonable. Next the team planned to incorporate more logs, and attach probabilities to the correlations. Early results looked promising. GitHub repo. Project: The team took on the task of sorting out lithostratigraphic well tops in a mature basin. But there are speedbumps on the road to glory, e.g. recognizing which picks are lithological (as opposed to chronological), and which pick names are equivalent. The team spent time on various subproblems, but there’s a long road ahead. Alongside these projects, Rob and I floated around trying to help, and James Beckwith hacked on a cool project of his own for a while — Paint By Seismic, a look at unsupervised classification on seismic sections. 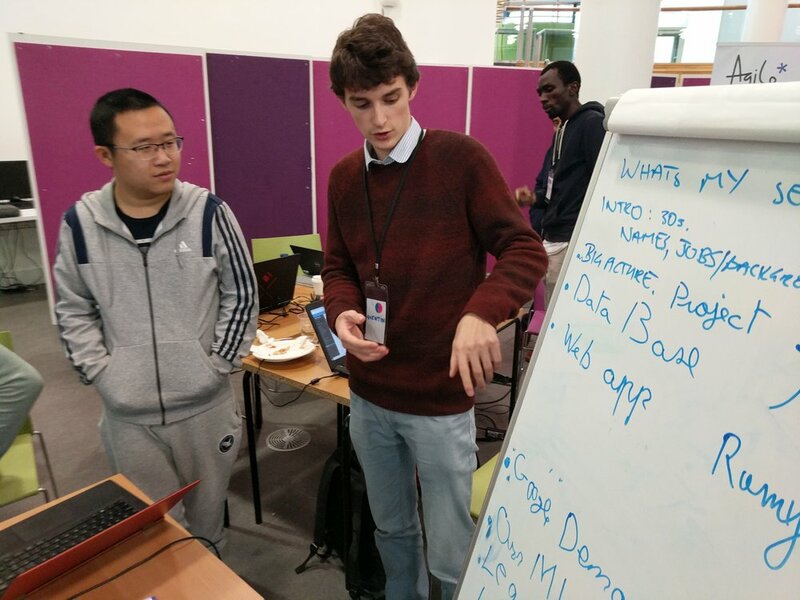 In between generating attributes and clustering, he somehow managed to help and mentor most of the other teams — thanks James! Thank you to The OGA for these events, and in particular to Jo Bagguley, whose organizational skills I much appreciated over the last few weeks (as my own skills gradually fell apart). The OGA’s own Nick Richardson, the OGTC’s Gillian White, and Robert Gordon Universty’s Eyad Elyan acted as judges. These organizations contributed to the success of these events — please say Thank You to them when you can! I’ll leave you with some more photos from the event. Enjoy! Yesterday I announced that we’re hatching a new plan. The next thing. Today I want to tell you about it. The transformative effect of open source software on subsurface science. Open source accelerates our work! The transformative effect of collaborative, participatory events on the community. We can make new things! The transformative effect of training on ourselves and our peers. Lots of us have new superpowers! Together, we’ve built the foundation for a new, open software platform. 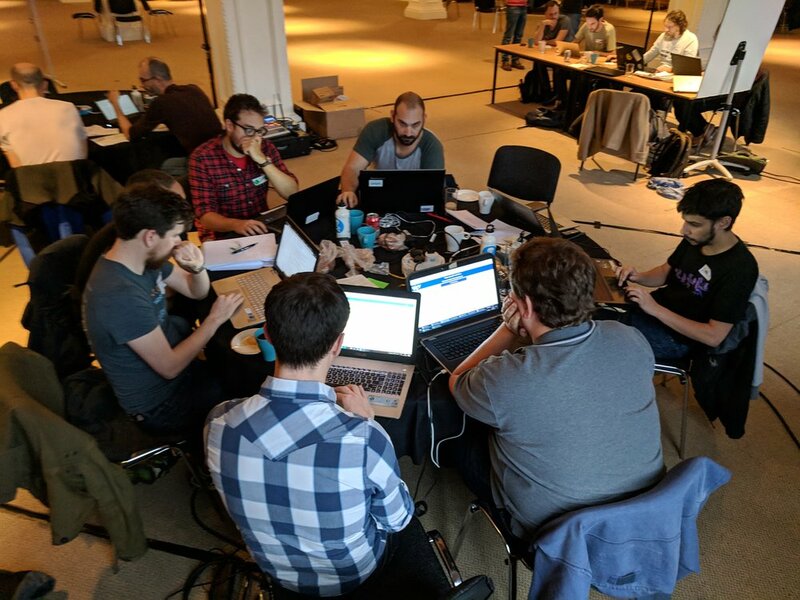 We think it’s time to refocus the hackathons as sprints — purposefully producing a sustainable, long-lasting, high quality, open source software stack that we can all use and combine into new tools, whether open or proprietary, free or commercial. We think it’s time to bring a full-featured unconference into the mix. The half-day ‘unsessions’ open too many paths, and leave too few explored. 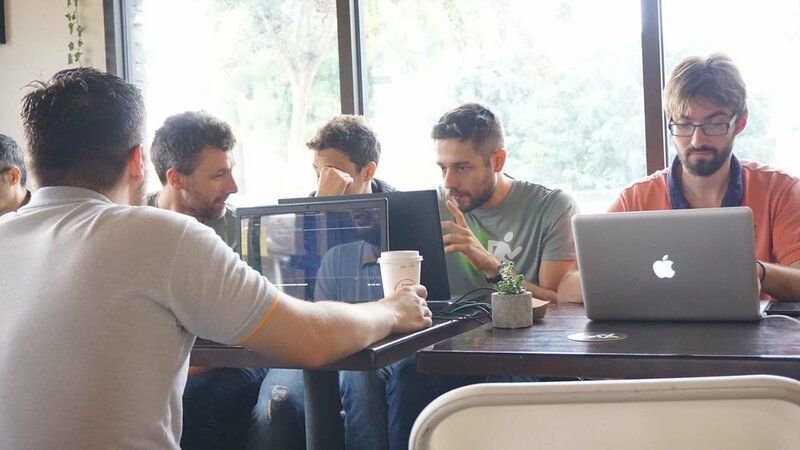 We need more time — to share research, plan software projects, and write code. Together, we can launch a new era in scientific computing for the subsurface. At the core of this new era core is a new open-source software stack, created, maintained, and implemented by a community of scientists and organizations passionate about its potential. Here’s the plan. 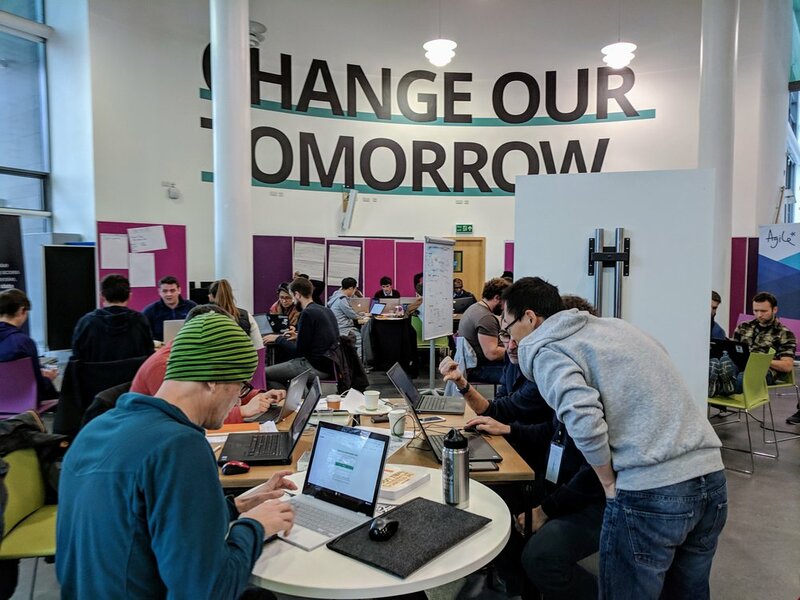 We’re hosting an unconference from 5 to 11 May 2019, with full days from Monday to Friday. The event will take place at the Château de Rosay, near Rouen, France. It will be fully residential and fully catered. We have room for about 45 participants. The goal is to lay down a road map for designing, funding, and building an open source software stack for subsurface. In the coming days and weeks, we will formulate the plan for the week, with input from the Software Underground. We want to hear from you. Propose a session! Host a sprint! Offer a bounty! There are lots of ways to get involved. Map data: GeoBasis-DE / BKG / Google, photo: Chateauform. Click to enlarge. If you want to be part of this effort, as a developer, an end-user, or a sponsor, then we invite you to join us. The unconference fee will be EUR 1000, and accommodation and food will be EUR 1500. The student fees will be EUR 240 and EUR 360. There will be at least 5 bursaries of EUR 1000 available. For the time being, we will be accepting early commitments, with a deposit of EUR 400 to secure a place (students wishing to register now should get in touch). Soon, you will be able to sign up online… we are working on a smooth process. In the meantime, click here to register your interest, share ideas for content, or sign up by paying a deposit. Thanks for reading. We look forward to figuring this out together. I’m delighted to be able to announce that we already have support from Dell EMC. Thanks as ever to David Holmes for his willingness to fund experiments! In the US or Canada? Don’t despair! There will be a North American edition in Quebec in late September. The Repro Zoo was a new kind of event at the SEG Annual Meeting this year. The goal: to reproduce the results from well-known or important papers in GEOPHYSICS or The Leading Edge. By reproduce, we meant that the code and data should be open and accessible. By results, we meant equations, figures, and other scientific outcomes. All the work went straight into GitHub, mostly as Jupyter Notebooks. I had a vague goal of hitting 10 papers at the event, and we achieved this (just!). I’ve since added a couple of other papers, since the inspiration for the work came from the Zoo… and I haven’t been able to resist continuing. The scene at the Repro Zoo. An air of quiet productivity hung over the booth. Yes, that is Sergey Fomel and Jon Claerbout. Thank you to David Holmes of Dell EMC for the picture. Aldridge (1990). The Berlage wavelet. GEOPHYSICS 55 (11). The wavelet itself, which has also been added to bruges. Batzle & Wang (1992). Seismic properties of pore fluids. GEOPHYSICS 57 (11). The water properties, now added to bruges. Claerbout et al. (2018). Data fitting with nonstationary statistics, Stanford. Translating code from FORTRAN to Python. Claerbout (1975). Kolmogoroff spectral factorization. Thanks to Stewart Levin for this one. Connolly (1999). Elastic impedance. The Leading Edge 18 (4). Using equations from bruges to reproduce figures. Liner (2014). Long-wave elastic attentuation produced by horizontal layering. The Leading Edge 33 (6). This is the stuff about Backus averaging and negative Q.
Luo et al. (2002). Edge preserving smoothing and applications. The Leading Edge 21 (2). Yilmaz (1987). Seismic data analysis, SEG. Okay, not the whole thing, but Sergey Fomel coded up a figure in Madagascar. Partyka et al. (1999). Interpretational aspects of spectral decomposition in reservoir characterization. Röth & Tarantola (1994). Neural networks and inversion of seismic data. Kudos to Brendon Hall for this implementation of a shallow neural net. Taner et al. (1979). Complex trace analysis. GEOPHYSICS 44. Sarah Greer worked on this one. Thomsen (1986). Weak elastic anisotropy. GEOPHYSICS 51 (10). Reproducing figures, again using equations from bruges. As an example of what we got up to, here’s Figure 14 from Batzle & Wang’s landmark 1992 paper on the seismic properties of pore fluids. My version (middle, and in red on the right) is slightly different from that of Batzle and Wang. They don’t give a numerical example in their paper, so it’s hard to know where the error is. Of course, my first assumption is that it’s my error, but this is the problem with research that does not include code or reference numerical examples. Figure 14 from Batzle & Wang (1992). Left: the original figure. Middle: My attempt to reproduce it. Right: My attempt in red, overlain on the original. This was certainly not the only discrepancy. Most papers don’t provide the code or data to reproduce their figures, and this is a well-known problem that the SEG is starting to address. But most also don’t provide worked examples, so the reader is left to guess the parameters that were used, or to eyeball results from a figure. Are we really OK with assuming the results from all the thousands of papers in GEOPHYSICS and The Leading Edge are correct? There’s a long conversation to have here. One thing we struggled with was capturing all the ideas. Some are on our events portal. The GitHub repo also points to some other sources of ideas. And there was the Big Giant Whiteboard (below). Either way, there’s plenty to do (there are thousands of papers!) and I hope the zoo continues in spirit. I will take pull requests until the end of the year, and I don’t see why we can’t add more papers until then. At that point, we can start a 2019 repo, or move the project to the SEG Wiki, or consider our other options. Ideas welcome! The following people and organizations deserve accolades for their dedication to the idea and hard work making it a reality. Please give them a hug or a high five when you see them. Luke Decker (UT Austin) organized a corps of volunteer Zookeepers to help manage the booth, and provided enthusiasm and coding skills. Karl Schleicher (UT Austin), Sarah Greer (MIT), and several others were part of this effort. Andrew Geary (SEG) for keeping things moving along when I became delinquent over the summer. Lots of others at SEG also helped, mainly with the booth: Trisha DeLozier, Rebecca Hayes, and Beth Donica all contributed. Diego Castañeda got the events site in shape to support the Repro Zoo, with a dashboard showing the latest commits and contributors. 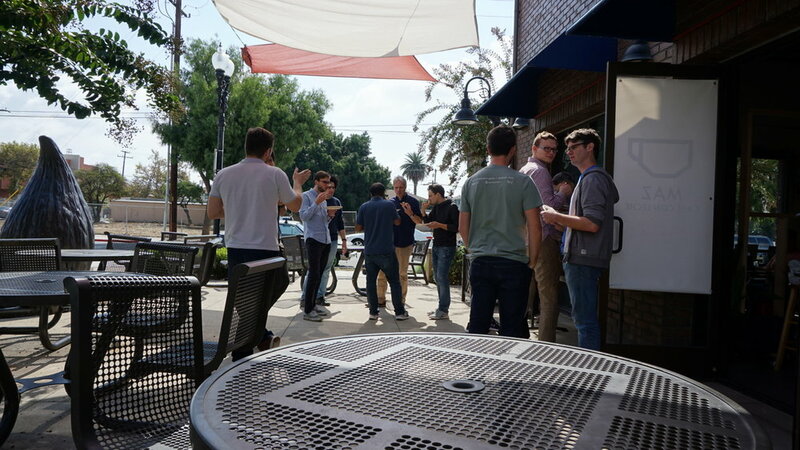 At the weekend, 28 digital geoscientists gathered at MAZ Café in Santa Ana, California, to sprint on some open geophysics software projects. Teams and individuals pushed pull requests — code contributions to open source projects — left, right, and centre. Meanwhile, Senah and her team at MAZ kept us plied with coffee and horchata, with fantastic food on the side. 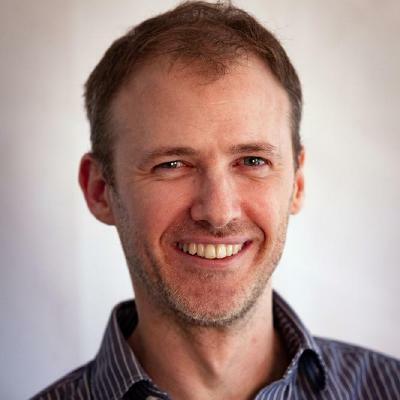 Gerard Gorman, Navjot Kukreja, Fabio Luporini, Mathias Louboutin, and Philipp Witte, all from the devito project, continued their work to bring Kubernetes cluster management to devito. Trying to balance ease of use and unlimited compute turns out to be A Hard Problem! They also supported the other teams hacking on devito. Thibaut Astic (UBC) worked on implementing DC resistivity models in devito. He said he enjoyed the expressiveness of devito’s symbolic equation definitions, but that there were some challenges with implementing the grad, div, and curl operator matrices for EM. Vitor Mickus and Lucas Cavalcante (Campinas) continued their work implementing a CUDA framework for devito. Again, all part of the devito project trying to give scientists easy ways to scale to production-scale datasets. That wasn’t all for devito. Alongside all these projects, Stephen Alwon worked on adapting segyio to read shot records, Robert Walker worked on poro-elastic models for devito, and Mohammed Yadecuri and Justin Clark (California Resources) contributed too. On the second day, the devito team was joined by Felix Hermann (now Georgia Tech), with Mengmeng Yang, and Ali Siakoohi (both UBC). Clearly there’s something to this technology! Brendon Hall and Ben Lasscock (Enthought) hacked on an open data portal concept, based on the UCI Machine Learning Repository, coincidentally based just down the road from our location. The team successfully got some examples of open data and code snippets working. Jesper Dramsch (Heriot-Watt), Matteo Niccoli (MyCarta), Yuriy Ivanov (NTNU) and Adriana Gordon and Volodymyr Vragov (U Calgary), hacked on bruges for the weekend, mostly on its documentation and the example notebooks in the in-bruges project. Yuriy got started on a ray-tracing code for us. Nathan Jones (California Resources) and Vegard Hagen (NTNU) did some great hacking on an interactive plotting framework for geoscience data, based on Altair. 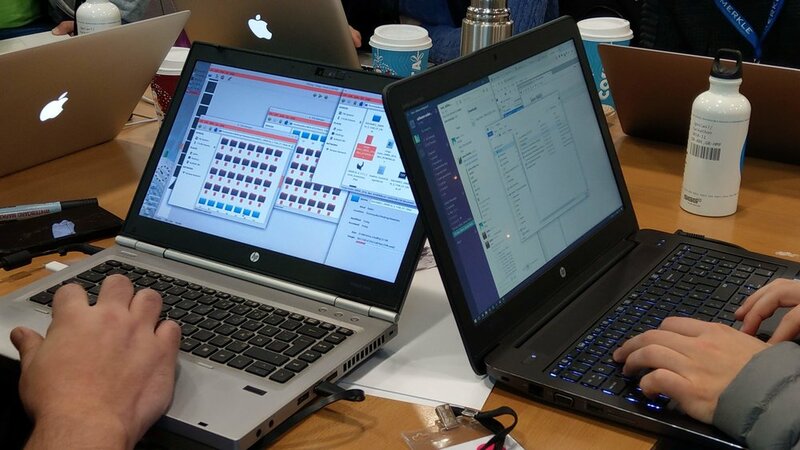 What they did looked really polished and will definitely come in useful at future hackathons. All in all, an amazing array of projects! 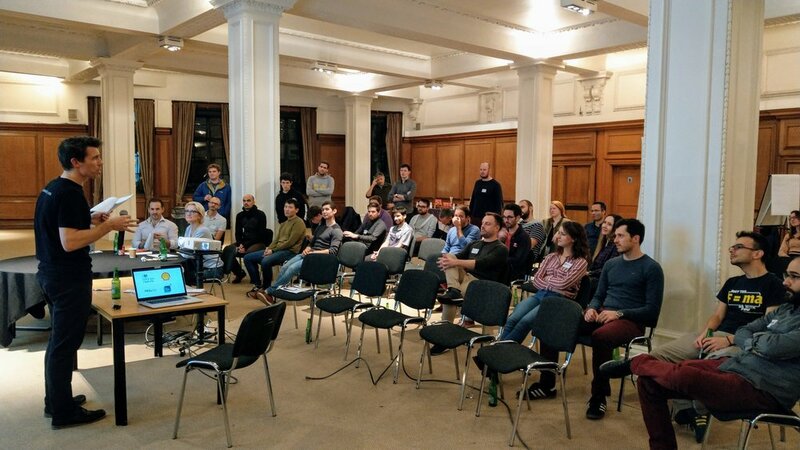 This event was low-key compared to recent hackathons, and I enjoyed the slightly more relaxed atmosphere. The venue was also incredibly supportive, making my life very easy. A big thank you as always to our sponsors, Dell EMC and Enthought. The presence of the irrepressible David Holmes and Chris Lenzsch (both Dell EMC), and Enthought’s new VP of Energy, Charlie Cosad, was greatly appreciated. We will definitely be revisiting the sprint concept in the future — einmal ist keinmal, as they say. Devito and bruges both got a boost from the weekend, and I think all the developers did too. So stay tuned for the next edition!